Peaktop 3+1 Rooms 8 Persons Large Family Group Camping Tent With Grountsheet. Best for Camping and hiking. Peaktop®is one of the top brands who sell quality structures like marquees, gazebos, camping tents etc. Peaktop has been doing tents business since early 21st century. After more than a decade of development, it has become one tent manufacturers with its own core production technology, more large market share and excellent after-sales support. This stylish and spacious 3-room tent is perfect for families and sleeps 8 people (recommendation). Fully sewn groundsheet in tent floor provides a completed insect protection for living and sleeping space. As the tent floor and the outer tent is tightly sewn together and sealed, no rain water could enter. The outer tent is pre-assembled and it is very quick to set-up. The 3 large zipper doors make entry easy without hassle, and the middle door can be set as an awning. Your satisfaction is our goal! 8 (up to 10 if needed). 210210200cm(Two big rooms)/110100200cm(the small room)/450400210cm(the main room). 210T polyester, 4000mm polyurethane coated, UV coated. The 210T polyester Fly sheet has better Tear-resistance, water-resistant, cold-resistant. Heavy duty fibreglass pole frame and durable material with a 4000mm hydrostatic head. All major seams are leak-proof welded with inside stitching. Fully sewn in groundsheet to provide more protection from the elements (water, crawlies, etc). 3 Large doors, middle door can set as an awning. Inner tents are fitted with mosquito netting and screens. Shock-corded fiberglass poles for easy setup. Rip-stop polyethylene floor keep water out. Breathable room material increase sleep comfort and reduce condensation. Complete with stakes, poles, carry/storage bag, and instructions. 36 stakes and 18 ropes. Pleas read the instructions before you go to camping. If the rain is expected, please try to dig the drain. Be sure to clean the zipper coils after every trip. Make sure the tent is completely dry and store loosely rooled in a dry&cool place. We do not accept COD /Personal cheque or company Cheque. We have many BuyItNow listing! Thank you for shopping from us! We are happy to do business with you. All orders will go through our accounting, customer service, and warehouse departments. We could not handle any rush orders. All items are inspected for damage or defects prior to leaving our warehouse. Please note we don't send to P. We accept defective item return within 30 days from receipt of your item. After this 30-days window, we will provide parts, replacement or repair service. Return must be received in new condition with original packaging. Our CS will try best to help & please each customer. We provide a warehouse collect service. Please checkout and pay before collection. Without completing checkout, our warehouse cannot arrange for goods to be collected. We will response any question in 24 hours (except WEEKEND and HOLIDAY). Please check your spam folder if no response from us. The item "Genuine Peaktop Large 3+1 Room Group Family Camping Tent 8-10 Man Full cover" is in sale since Tuesday, March 19, 2013. 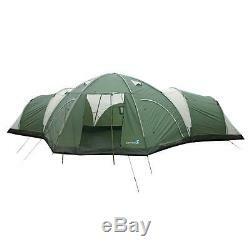 This item is in the category "Sporting Goods\Camping & Hiking\Tents & Canopies\Tents".top" and is located in Stowmarket, Suffolk. This item can be shipped to United Kingdom.